The breviary would have been used in the prayer services or offices of the clergy (or of monks and nuns) which were held eight times each day. It gives the prayers, readings and hymns which changed with each day. For major feast days, instructions for processions and special presentations of hymns and readings would be written in red, as on this page for Easter prayers. The instructions at the top of the page detail a procession to the sepulchre. 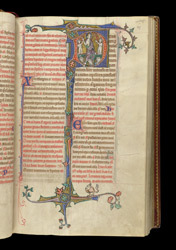 The historiated initial of the prayer said during the ceremony has a depiction of the Resurrection.